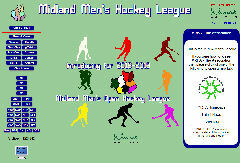 The Men's league currently administers hockey for some 380 teams from over 100 clubs across 8 Midland counties. It's structure consists of area divisions within leagues of 1st XI, 2nd XI, 3rd XI, and Central sides. Within these pages you will find all you need to know about Midlands Men's Hockey including League tables and fixtures, along with key club information and contact details. The fixtures archive goes back to 2002/2003.